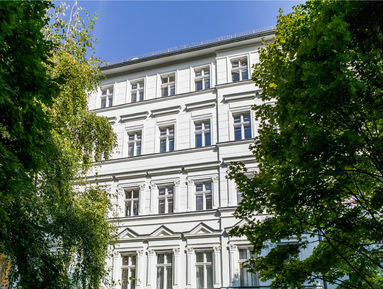 The five story Wilhelminian era building at Sorauer Strasse number 12 offers relaxed and contemporary living in the heart of one of Berlin’s most popular neighbourhoods; the heritage protected Wrangelkiez. The bright façade features attractive stucco elements, and the period styling continues in the building’s interior, where many classic features are preserved. The building, especially the façade, was extensively renovated in 2012-13. The 87sqm apartment, located on the third floor, offers three spacious, well laid-out rooms, two of which face south-east onto the quiet, residential street. The well-appointed kitchen leads out onto a balcony overlooking the large courtyard garden, perfect for weekend breakfasts. The apartment enjoys high ceilings with stucco moulding, large windows, and lots of natural light throughout. It was recently renovated and modernised, ensuring comfortable, modern living in this classic building. The building lies on a peaceful, tree-lined street in Kreuzberg’s coveted Wrangelkiez. The area is well-known for its cafes, restaurants and bars, and the apartment is within easy walking distance of Görlitzer Park. Also within a few minutes’ walk is the U1 underground line, one of the easiest ways to commute from East to West in Berlin. Life is good in Wrangelkiez!